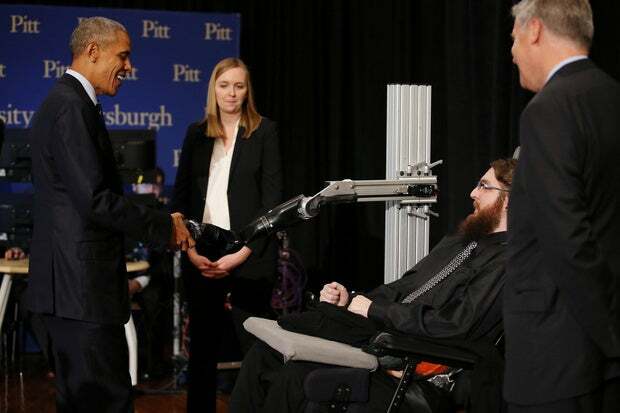 President Barack Obama on Thursday shook hands and fist bumped with a paralyzed man who was using a mind-controlled robotic arm. "Today he can move that arm just by thinking about it. He can once again feel the touch of another person," said Obama, speaking to an audience in Pittsburgh. "Researchers will tell you there's a long way to go. He can feel pressure with precision. That's what science does. That's what American innovation can do. Imagine what breakthroughs are around the corner." The president spoke about meeting Nathan Copeland during the White House Frontiers Conference. The one-day conference focused on spurring innovation and bolstering the country's strength and standing in science and technology, while taking on new challenges like curing disease, solving climate change and exploring deep space. 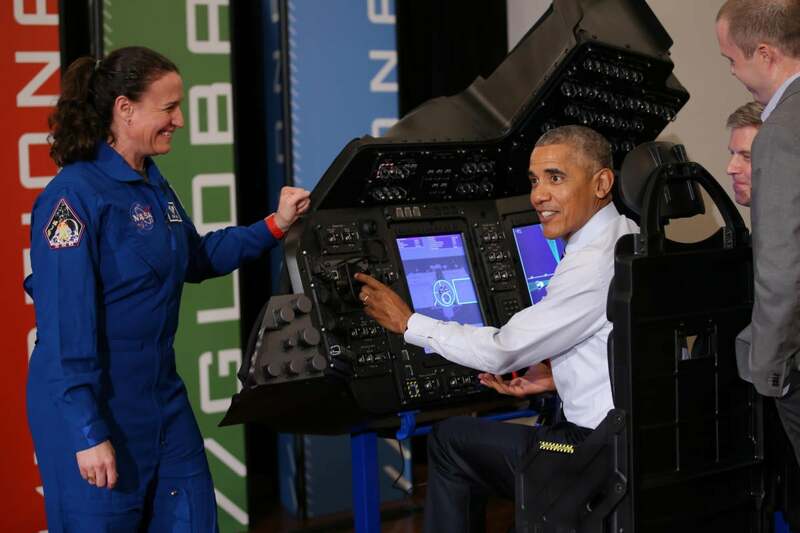 Obama followed a long list of speakers that included scientists, researchers and business people from the space industry, urban planning, computer science, transportation and health care. Copeland, who was paralyzed in an auto accident, is taking part in DARPA-funded research performed by the University of Pittsburgh and the University of Pittsburgh Medical Center. The technology being tested enables Copeland to feel the sensation of touch via a neural interface system connected to a robotic arm. Meeting Copeland and learning about the technology he's testing was just part of Obama's day at the conference. The president saw a space capsule, an unmanned quadcopter that could search disaster areas and even tried a spacecraft docking simulation. President Obama shakes hands with a robotic arm operated by Nathan Copeland, a quadriplegic brain implant patient who can experience the sensation of touch and control a remote robotic arm with his brain during a tour of the innovation projects at the White House Frontiers conference. "I'm a science geek. I'm a nerd," he said to loud applause. "I don't make any apologies for it. It's cool stuff." Obama believes in continued tech research and wants all students to take science, technology, engineering, and mathematics (STEM) courses, which he believes will not only bolster the U.S. economy but also revitalize struggling American cities. "Innovation is in our DNA. Science has always been central to our progress," said Obama. "[Pittsburgh] has been revitalizing itself through technology for a very long time.... Stories like that are not just happening here in Pittsburgh or Silicon Valley. They're happening in Chattanooga, Charleston and Cincinnati." Science also will enable us to take on some of the biggest challenges facing us, he added. "Only with science can we take steps to cleaner energy," Obama told the conference audience. "Only with science do we have the chance to cure cancer and Parkinson's -- diseases that steal our loved ones too soon -- to lead humanity farther out into the frontiers of space, not just to visit but to stay." Obama also talked about science deniers and the dangers he said they bring. "I get so worked up when I hear people willfully ignore facts or stick their heads in the sand about basic scientific consensus," he said. "It undermines the very thing that has always made America the engine for innovation around the world. It's not just that they're saying climate change is a hoax..., it's that they're doing everything they can to cut funding for research and development." He added that listening to science only when it fits a certain ideology is "the path to ruin." "When the Russians beat us to space, we didn't deny that Sputnik was up there," said Obama. "That wouldn't have worked. No, we acknowledged the facts and then basically built a space system overnight and then beat them to the moon.... That's where facts will get you. That's where science will get you." To keep America innovating, Obama said the government and schools need to make sure students are educated in math and science. Noting that his administration started the White House Science Fair and helped bring high-speed Internet access to classrooms across the country, the president said he's fully behind pushing STEM education. "We're working to help all of our children to understand they have a place in science and technology," said Obama. "We want Jamal and Maria sitting next to Jimmy and Johnny because we want them all involved in our future.... To get where we need to go, we need to lift everybody up because we want a brilliant team. We don't want someone with a great idea not in the room because she's a woman."